I went to Sam’s Club yesterday and spent a lot of money. We now have toilet paper, paper towels, paper plates, dish soap, hand soap, moist towelettes, and nothing to eat. Ha! Tell me I’m not the only person who does this! 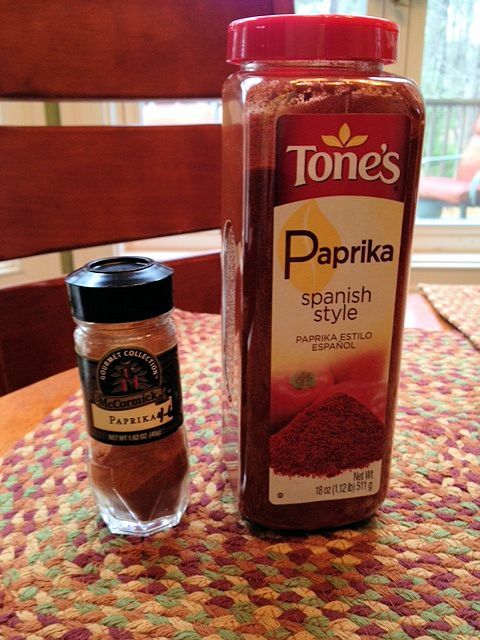 I did pick up this giant-sized bottle of paprika. It cost the same as the small one next to it from the grocery store. I thought I’d better start learning how to make some Hungarian food to use this giant bottle up. My internet sources tell me that it loses its flavor in a year. That’s a lot of goulash by next March. 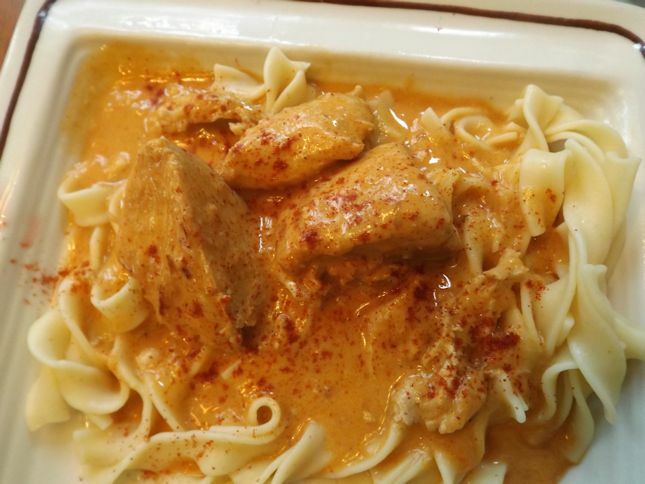 It is rainy and cold today so a nice plate of Chicken Paprikash hit the spot. In a large dutch oven, soften the onions and garlic in 1 tablespoon of the butter. Add the chicken and brown slightly. Add the broth and paprika and place the lid on the dutch oven; simmer until chicken is tender, about 30 minutes. In a small skillet, melt the butter and stir in the flour to make a roux. Add some of the liquid from the chicken to make a thick sauce. Add the sour cream. Place mixture in with the chicken and heat through. Serve over noodles. Two tablespoons down, many more to go.